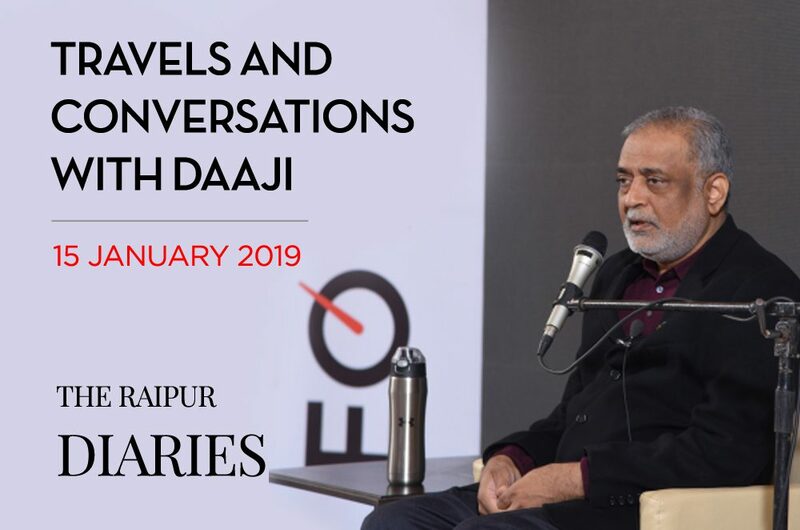 In the evening at 7 p.m. Daaji went to a gathering of the EO – Entrepreneurs’ Organisation, a group of young entrepreneurs of Raipur who have created large and successful business houses. It started with a beautiful five-minute video, which can be seen on YouTube, introducing Kanha Shanti Vanam Ashram. How wonderfully it illustrates the ‘symbiotic relationship between nature and spirituality’ and how uniquely that would speak to the entrepreneurial spirit. 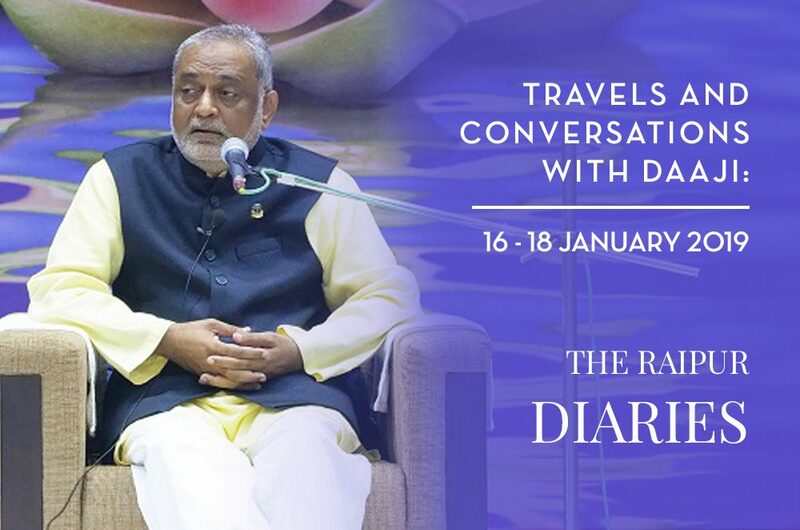 This was followed by Daaji’s sparkling talk, then an experience of Heartfulness Relaxation and Meditation, and finally a Question and Answer session. All present felt the rapport he was able to build up with those attending in a natural way, without artifice, and the warmth with which they responded. The whole session was a marathon of almost two hours. Later on Daaji remarked that this was perhaps the most receptive group he has met in many years. 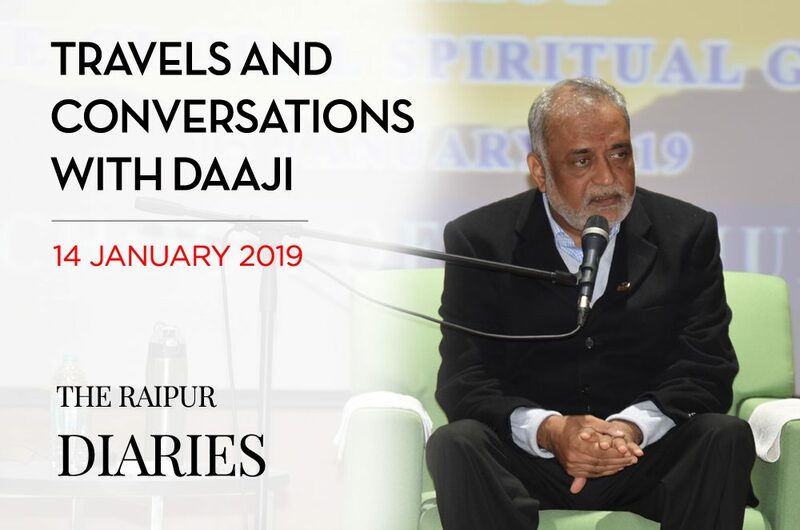 In his talk, Daaji said, “You may be a millionaire in your life but what if you are a spiritual pauper?” He said that it was possible to be a millionaire in both these aspects of life and that this was what was required in these times. He spoke of the need for moderation – for the sake of community and family life – and the need for an enforcement of corporate social responsibility. This was followed by a session of Heartfulness Relaxation and Meditation. 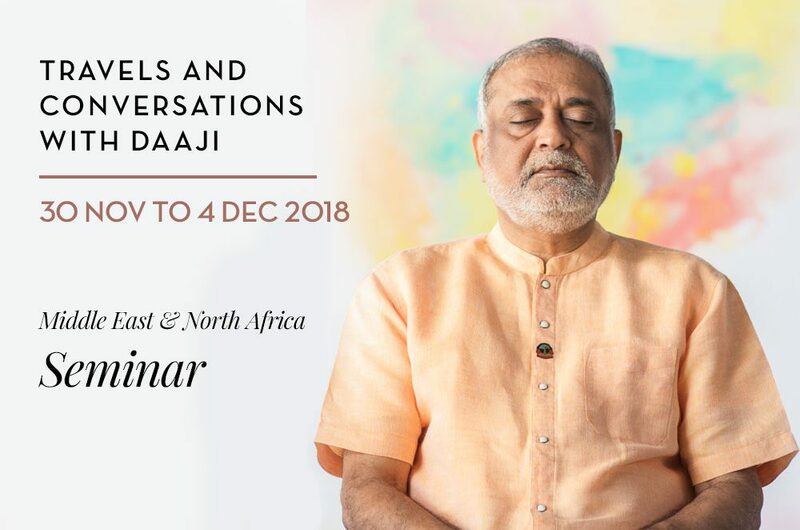 Daaji: In order to understand what spirituality is, we have to first understand what religion is. Religion is all about dogmas and beliefs. If we say we believe in God, it’s usually borrowed knowledge. Religion is borrowed knowledge from scriptures, from our elders, and from our priests. The backing of experience substantiates our belief. Spirituality provides this experience. Religion binds us to a belief system. Spirituality makes sure you experience the real spirit behind the belief. In religion you can get away with, “My priest will do puja on my behalf.” You give the responsibility to someone else. That can never happen in spirituality. No one can meditate on your behalf. You have to do it yourself, because spirituality is all about experiencing what we believe in. If you believe in God, you must experience His presence. If you experience His presence, then you can say there is some strength in your belief. If there is no experience, then your belief system is like a pendulum. When life is going well, you say, “Thank you God.” When it is not going well, you question the very existence of God. You become like a yo-yo. Once you have experienced God through spirituality, that yo-yo state will disappear. But that doesn’t mean that spirituality is everything. Experience – however noble, however great, however deep – has its limitations. So what next? Day after day, when our experience becomes better and better, what emerges? Experience leads us to, “I have now to become something.” Experiencing spirituality versus becoming spiritually self-sufficient is a different ball game all together. Eventually, this ‘becoming’ is also a handicap. In the words of Saint Kabir: it is like raindrops falling in the ocean – there is no raindrop left behind to express its self-beauty or the vastness of the ocean, because it has become the ocean. It cannot come back and tell you, “Look how great this ocean is,” because its identity, the ego, is gone. So even though spirituality transcends religion, we should not remain in the realm of experiences. We transcend experiences to become. Having become, we go further into a state of being and then to a state of non-being and that’s the state where we merge into everything. 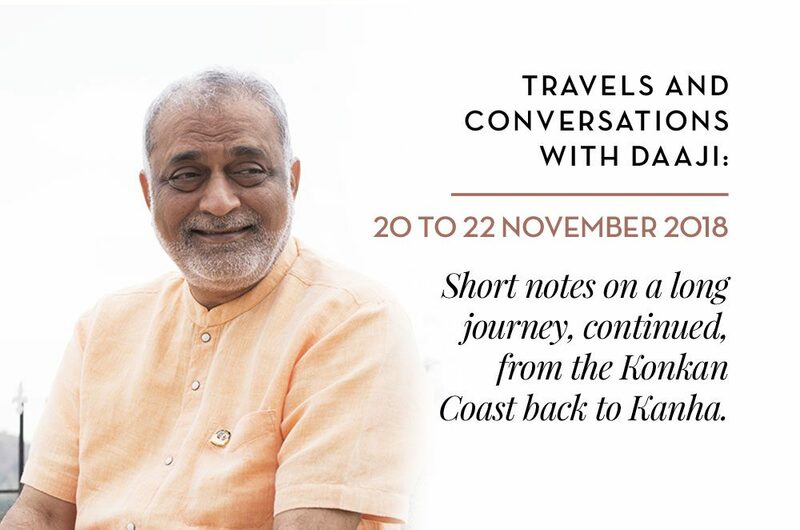 Q: With so many meditational practices prevailing, why did you feel the need for the Heartfulness Way? Daaji: There are so many systems that I have come to know only now. When I started this meditation in 1976, I knew only Shri Ramakrishna Paramahansa’s methodology. I used to cry reading his Gospel, praying one day that I would find such a guru who would help me experience all that he was able to experience himself. I knew no other method. But when you go through all the books of the Complete Works of Swami Vivekananda, all nine volumes, not even on a single page mentions any methods of meditation. Nowhere. If you read the Bhagavad Gita and think you have learned the method of meditation, you’re fooling yourself. Lord Krishna said to Arjuna when he was asked this question, “Meditate and experience myself in your heart.” How many of us were able to take the hint from the Gita? And even if it says meditate on the heart, how? How will you go deeper within without Pranahuti? Pranahuti is like a lift that we take up and down. It helps us to go into superconsciousness; it helps us to go into our subconscious. This is the most fantastic system I’ve found so far. Q: What is the importance of religious rituals and prayers in the path of spirituality? Daaji: Some rituals are good, like Ekadashi [fasting]. They will not reveal God to us, but they will improve our health. Ekadashi has nothing to do with God; it’s all about our health. Only when our body is healthy will we be able to sit longer to meditate. The deepam at the Hindu festival of light, Diwali, is a symbolic thing. The meaning behind it is from darkness to light: from the darkness of my ignorance towards the light of knowledge. Symbols and rituals are there for many reasons – psychological, physiological, neurological – but none of them are for God Realization. For God Realization you always have to close your eyes and experience His presence. Some people say, “I do mantra japam.” It’s good, and it will help you concentrate and increase your mental capacity to some extent, if you are able to hold your mind on reciting. But when you meditate you are not reciting anything. Imagine if you are reciting your mantra and God comes and goes, will you notice? When you recite, you are busy reciting. The moment of experience is lost when you are busy with anything, be it a mantra or cursing someone – you are still busy. So rituals are okay if we understand them heartfully. Mantra is only to convey a meaning, but people go on reciting without actually understanding the meaning behind it. And if you don’t understand the meaning behind it then how are you going to implement that in your day-to-day life? Q: There are so many meditative techniques, and so many spiritual gurus nowadays. How do you find a guru? Is it by chance? Daaji: This is very relevant in modern times. Your heart will always tell you the truth. It will not fail. And being a lady you are more advanced than most men. You have the advantage of the faculty of feeling. You will always know it. The best experience is that which makes your heart happy. That’s all. Are you happy with that experience? If it’s good, continue with that experience. If you are not happy, and you are still searching, then think about your next move. How to find the right guru? Your soul, atman, will always tell you. The soul has a purpose for why it incarnated, and until that purpose is fulfilled it will keep on recycling itself. This we call life and death, birth and rebirth. When the soul finds that a particular system or a guru is appropriate, it will shower abundant grace and peace within. If you are following the wrong person, it will always make you restless. It will tell you to run away. Your heart will always tell you the truth. After the session, Daaji was invited to a small table to eat, and slowly a small group of people joined him without formality or pomp. It was a joyful and light occasion, while others enjoyed the buffet, which had been laid on for everyone.